Question: If you could see the orbit of Venus would it fill the whole sky? You can use your hands and arms to see the size of the orbits of the solar system’s inner planets: Mercury and Venus. Imagine (as pictured below) if the orbit of Mercury were visible as a red oval and the orbit of Venus were visible in green. Two hand spans show the orbit of Mercury, elbows show the orbit of Venus. Caution! Do not look directly at the Sun without proper solar safety glasses on. Turn toward the Sun, hold your arms out straight, hands up in the air with fingers spread wide and thumbs touching. 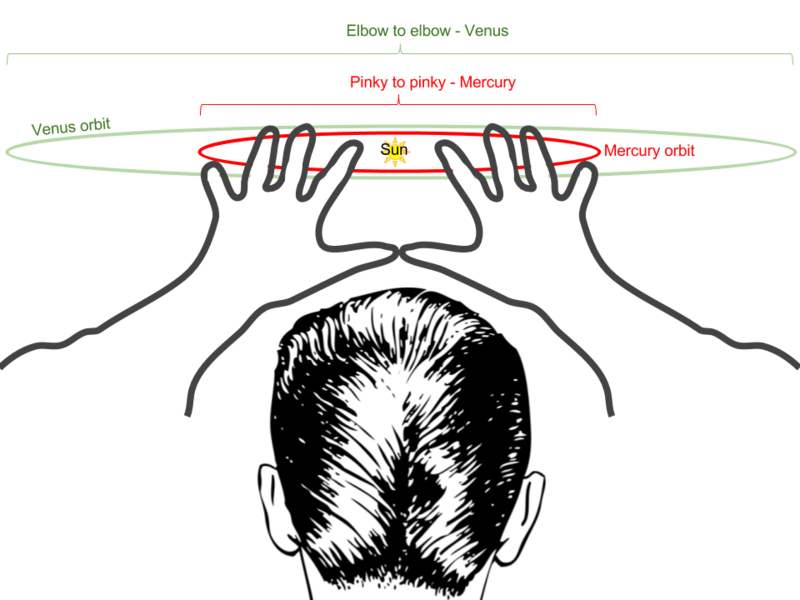 Your pinky fingers now span the width of the orbit of Mercury and your elbows span the width of the orbit of Venus. Both of the entire orbits of Mercury and Venus orbits would be visible in the sky all at once – if they could be made visible during the day.